Ron Jackson’s last business was a chain of record stores in Florida. That enterprise failed when the rise of the Internet created a new distribution channel for music. But Ron noted an increase in online traffic to his website, MusicParadise.com, and the subsequent deregulation of dot US domain name extensions in 2002. This gave him an idea. Fast forward a few years and Ron was the proud owner of 800 3-letter .us (LLL.us) domain names. Not just any 3-letters, but the good ones (find out which in the interview). And with these 3-letter domain names came a unique sales strategy that he developed that forgoes the usual practice of domain parking. In addition to owning what is now a portfolio of more than 5,000 — including 2,000 .us — domain names, Ron Jackson publishes the industry’s leading trade magazine, DN Journal. The online publication is a greater source of income for Ron than his domain name sales. Surprised? Watch this interview for many more insights you did not know about Ron and about domaining. Ron Jackson is the editor and publisher of DNJournal.com, and president of Internet Edge, Inc., a web publishing company he founded in 2000. Before that, Ron spent 20 years as a radio-TV broadcaster before opening a chain of record stores that he operated until the Internet transformed music retailing. Publishing useful content can’t be haphazard; it requires time and effort. Ron spends more than two days each week producing one column – Domain Sales. He starts on Monday reminding contributors for data, then verifies sales, and finally sorts, analyzes and publishes the data with commentary. .org domain names can perform very well with pay-per-click (PPC) advertising because visitors to those websites have a perception of trust for the extension. For example, at birthcertificates.org people will expect to pay for a copy of their birth certificate, so PPC advertisements on that site will do well. Sometimes you buy bad domain names. When that happens, it’s not worth your time to market them for sale. Drop them. Let someone else have the marginal ones. Cutting your losses and reducing your liability is a cost of doing business. When selling domain names to other domainers (referred to as “wholesale”), you might buy a domain name for $8 and sell it for $50. When selling domain names to end users (referred to as “retail”), you can buy a domain name for $50 and sell it for $1,000. Under $5,000 is the sweet spot in the buying market. In 3-letter and 4-letter domain names, not all letters are equal. Fewer words in the dictionary contain the letters q, x, y or z. On the other hand, many company names include the words Inc., Systems or Services, so domain names ending in i or s are more desirable. Parking 3-letter and 4-letter domain names does not usually get great results because there are no keywords on which to base the advertisements. As a result, Ron is building personal landing pages for each domain name to educate and provide assurances to potential buyers. Sample: afi.us. A buyer can’t afford the domain name all at once? Finance it for them. You maintain ownership until the entire domain name is paid off, and you can earn a fee for the service (Ron charges 15 percent per year). And if a buyer defaults, you still own the domain name. Regardless of how good your domain name portfolio is, statistics show that in an average portfolio, only 1 to 2 percent of domains are sold per year. Assuming 98 percent of your domains are not going to sell, it is prudent to diversify your revenue streams. Domain name registrars are willing to reduce their prices if you own a large domain name portfolio. At an average of $8 per domain name, 5,000 domains represent $40,000 of annual income for a registrar. Michael: Hey everyone, my name is Michael Cyger. I’m the publisher of DomainSherpa.com, the Domain Name Authority. DomainSherpa.com is the only place where you can get in-depth interviews with concrete actionable advice from successful domain name investors who are willing to tell you how they did it and teach you so you can go be successful at building your own domain name portfolio. 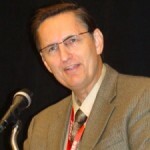 Joining me today is Ron Jackson, editor and publisher of DNJournal.com, the domain industry newsmagazine. It is hard to imagine of anyone not knowing about DNJournal.com but for the uninitiated it is one of the most popular websites in the world devoted to the domain name industry. I am honored to have Ron on the program. Ron is an industry legend. He curates a phenomenal online resource. And for anyone who has met Ron you already know that he is a consummate professional and a really nice guy. In this interview you will hear how the rise of the Internet put Ron’s record store chain out of business. And how today he is successfully domaining and selling 99% of his domains to small Mom and Pop type businesses, with a good number being of the .us extension. Along the way we will find out how he buys, monetizes and sells and manages his own domain name portfolio while still continuing to deliver fantastic editorial content week in and week out. So first of all welcome Ron and thank you for doing the interview. Ron: Thank you Michael. It’s great to have an opportunity to talk with you and I really appreciate the invitation. Michael: It’s my pleasure. Ron, your biography is openly available at ronjackson.com. There everyone can read about your prior careers as a weatherman for ABC, a journalist for Fox TV, business owner of a record store chain, and then an online journalist at DNJournal.com starting 2003. Let’s start this interview with your domaining career. Why did you start DNJournal.com? Ron:	Well the reason that the website was started was, first I should say that that was an afterthought. That is not what I came into the business to do. I came in to buy, sell and monetize domains once I discovered that this business existed. And it was only after I got into the business and through the first domain form the inform.com started making acquaintances who are in the field or have been in it sometime before me that I started hearing stories from these guys about what they had done before and how the domain business had turned their lives around. And having been a journalist most of my professional life before getting into domains I thought wow these are some pretty great stories. So I started looking around the internet wondering what resources were telling those stories, because in every business I had been in before there was always a trade journal that covered the industry. When I was in broadcasting we had Broadcasting Magazine. Later when I got into the music business we have Billboard Magazine that came out every week. But there was nothing like that in domains. So I thought well someone has to be telling these stories because they are really great inspiring stories. Some of the Horatio Alger stories in our business. People who literally started with nothing and became multi-millionaires. So I started the magazine on New Year’s Day of 2003. The original idea though was not for it to be a business because I didn’t really see any business prospects for that. But the primary reason that I wanted to do it was to get the stories out there and in the course of telling those stories you get to know some of these pioneers better and kind of tap their intellect or get some tips from them that I thought might help me in my own domaining business. So I looked at it as more of just a hobby thing. It stayed that way for a few months but to my surprise after we had been online for a handful of months, I believe it was Sedo that was the first major domain company that approached me and said that they would like to advertise on the website. And they said would you send your media kit over to us. And I had no media kit because I had never envisioned that anyone would want to advertise on this thing. So I said. “You know I’m really busy today but I’ll get that over to you tomorrow”. So that night I’m saying what do you charge for ads as I had no idea. And a guy who had become a good friend of mine Matt Bentley was there at that time and I sent Matt over the information, what I wanted to charge the next day and he got back to me and said, “Ron you sure this is right?” I go, “Now if it is too much we can negotiate”. I was asking for like ten bucks or fifteen dollars or something really idiotic like that. And Matt goes, “No I think you might be a little on the low side”. He gave me a little bit of guidance on the publishing end of the domain world. All of my experience had been as a television broadcaster and not really like in the magazine space. So that is how the whole thing got started. Initially as those first advertisers came on board, once Sedo did then others would come along, I was able – I could afford to invest 25% of my time into the publication let’s say. And as more came then it became ½ my time and then ¾ and then I would say by ‘06 it was taking virtually all of my time. And by that point in time I was no longer doing a lot of domain research. I’d already built up a portfolio of thousands of domain names. So domainnamejournal became really the primary aspect of the business. Michael: So are you spending close to 100% of your time right now on DNJournal.com versus your own domaining? Ron: I would say about 90% maybe because I’m not actively looking for more domains now; I think I have enough to last the remainder of my lifetime in terms of looking at the number that turn over. I just don’t really need more. I mean if something falls into my lap or if I get an idea and I will look for it but really the magazine takes all of my time. Michael: What would you say is the current mission of DNJournal.com? Ron: I think it kind of the same thing that its always been which is to just kind of provide a window into our world for a lot of newcomers who come along as well as the established veterans in the field so they just have something that they can look at and see what is happening week in and week out in their business. It is also I think a good vehicle for people outside of our industry, mainstream business, to kind of see what we are all about. And a large part of it is to try to educate those people to the value of domain names. That the name is very important because to the man on the street they do not quite get what does a domain name be worth thousands of dollars. How is it going to benefit my business? So by talking to a lot of experts in the field – and something I’d like to do more of is maybe highlight successful business models who have built around the domain fact. We are working on a story like that right now that illustrates that concept really clearly. Michael: So your weekly domain name sales charts are the talk of the industry. Many a domainer’s goal is to get into those top sales charts that I have spoken to you…I want to give the audience an idea of what goes into creating those charts. Can you talk about the inputs to your process and how long it takes you to produce those charts? Ron: I spend about two days out of every week producing that one column that comes out on Wednesday afternoon or Wednesday evening. The way the process starts is on Mondays I send reminders out to all the contributors. It has been made possible because we have gotten so much cooperation from the main sales venues in this space. And that is something that I mentioned to Matt Bentley that I mentioned earlier, and I have to credit him for as he originally contacted me with that idea in late 2003. He said, “You know what the industry needs is something like the real estate business has which shows people sales so they can get an idea of what comparable domains or properties should sell for”. He really felt that that was something that was direly needed and he volunteered to send me Sedo’s data back then and soon after he did a number of others joined parade so to speak because they understood how important that was for everyone in the business as well. So over a period of time most of the main venues came in. And then we also get data from private sales from private individuals. There is an explanation – a detailed explanation of how we collect data and what it is we are reporting in a link at the bottom of the main Top Twenty chart on that report, because a lot of people think that someone can just call or sends me some unverified report and I publish it. That is not what happens, not what happens at all. What we do that I think set it apart is I try to verify, particularly all those private sales that come from a source that we don’t know well. They actually have to send me screenshots of the money transfers and that sort of thing. So we look into those before reporting them because we want to make sure that the report is as accurate as humanly possible. Otherwise it is not going to have any value. It is almost impossible to say something is 100% accurate because somebody could try to counterfeit data. I think that is really kept to a minimum. And the hurdles to get in are such that it is really not worth in most case someone’s time to try and do that. Michael: I didn’t realize that there was so much involved in producing those charts and so much work that you do to verify those results. No wonder they are the talk of the industry. Ron: That is what is time consuming. Like I said we start the process on Monday with the reminders and then we start getting the actual data on Tuesdays. We collect that throughout the day. The cut off time is typically 6 pm eastern time on Tuesdays. And now that I have all that data in then I spend most of Tuesday’s evenings and sometimes Wednesday morning compiling that data into the charts that you see, both in the weekly report and we also update the year to date charts at the same time. Then once your charts are up on Wednesday then I sit down and write the text portion of the article that accompanies it in a kind of adjust it all in a way to tell you what the trends are. What these sales mean historically and that sort of thing. That is part of the story. Michael: Yes, your expert analysis. Ron: That process takes about three more hours to do that. And then when that is done you about the process of getting the word out. Of course we will do it through an RSS feed through the forums. We have our own opt in list of email subscribers so we start a mail out to those people to let them know that it is out. So that takes a substantial portion of my editorial time every week. Michael: I can imagine. When was the last time you took a vacation that was more than a couple of days? Ron: What does this say Diana? Oh you hit a sore point. She said like our twenty fifth anniversary. We had plans for our twenty fifth anniversary and it so happened that the date of the anniversary fell during the Domain Round Table Conference that was help in Washington, D.C. in June of 2009. And I said, “You know Washington is really nice this time of the year. There is a lot you could do there”. You know anniversary and I was surprised she didn’t give me a really hard time. She went to the conference with me when she…She goes to a lot of the shows with me which is really nice. And the Thought Conversion people were really nice once we got there. They found out that we were there during the anniversary and they brought out a nice anniversary cake for us that night at one of the evening events. They made us feel really at home. The only problem is they served the cake along with a service knife which Diana had at my throat once again it was brought out that it was our anniversary. There is a picture of that floating around somewhere. But we both had a smile on our face. And I had to pay for that. And the way that I did that was that after the show we did a kind of twenty fifth anniversary bed and breakfast tour of Florida where we kind of went to romantic spots and spent a couple of nights and then moved to another part of the state. It actually turned out to be kind of cool way to spend your twenty fifth anniversary year. Michael: Very nice, and I had the pleasure of meeting your wife, Diana, at DOMAINfest a few weeks ago. Do you think you could pick up the camera and scan over to Diana so we can say hi to her? Ron: She said she would love to but she just came in from the sun and she is not looking her best right now so she doesn’t want to be on the camera. Michael: Alright, next interview is going to be with Diana. Alright Ron I want to turn our attention to you domain name portfolio and ask you a few questions about those. Let’s start with how many domain names do you currently own and roughly how do they break out by TLD and your category system? Ron:	I have over five thousand now. At one point I had over seven thousand. But them like a lot of people as PPC revenues fell off and I did some calling in there. Traffic, though and PPC had always been the least important of the revenue streams that I relied on. So fortunately when PPC took a nosedive it didn’t impact me a lot. I just trimmed some of those and kept the names that I felt had value as a brand to a small business. And whether or not they made anything at all on PPC they were of value to me. So I’ve kept that core group of about 5 thousand. I think I’ve whittled those down pretty much to where I don’t drop a lot of domains anymore. A handful here and I don’t add a lot more. So I am pretty much where I want to be on that. I buy domains in about four or five probably different TLDs. When I started out I came in at a time when I thought that most of the great names were taken and so many .coms were already registered that I thought that I needed to look for a niche. And you mentioned the value of .us and that was one place where I thought there might be a niche looking back at it in 2003. So I registered or purchased a lot of three letter domains in that TLD a lot of one word keywords and that sort of thing. Which now, particularly now that the internet has exploded even more and millions of new businesses are coming online each year I do well with small business buyers on those because they are priced out of the market for the equivalent in the .com. And when they go to look for the next best alternative a lot of people look at the country code, which over all is the second best category to .coms today I think. Michael: So you just said a bunch of stuff that I want to dig into. I want to dig into the .us, I want to dig into the other portfolios but going back to the TLD: So you have got .com, you’ve got .us, what other TLDs do you have and roughly what percentage of your portfolio, of your five thousand portfolio do you think roughly how do they break down? Ron: I like .org really well and I always have. The .org actually has been some of my best performers on the PPC side because it is a very trusted and well known TLD as the .com is. So if you get the right kind of keywords that are related to something that might be non-profit or governmental, for example birthcertificates.org which there is a commercial use for that name, where people will pay for a copy of their birth certificate so there ad links available for that. Probably my best performer right now and has been for a couple of years is federalgrants.org. Which it again has kind of a quasi official association and there is also a way to monetize a name like that. So I am a big fan of .orgs. I probably have about half my portfolio in the original extensions and about half in the new. And they all contribute something overall to the stream. It gives a nice bit of diversity there I think. Michael: When you first started buying you said that you hit a peak of seven thousand. You trimmed it down to five thousand. That trimming process was that letting domains expire? Was that packaging together and selling them for pennies on the dollar? How did you trim those two thousand domain names? Ron: I ended up just dropping them. I did think about selling them but in my case I found it just wasn’t worth the time to market them. So I thought, you know what I’m just going to drop them and let them…there were some names in there I thought, but I thought just let somebody else pick them up and most of them I see did get picked up just fine. And hopefully somebody else can make some money with them. But it just wasn’t worth the effort and there aren’t that many venues where you could go out and put domains…you could do it on the forums but even that is a very slow process. So basically I just cut them away and just wrote that…Some of those things you renewed say maybe five or six times so I have $50.00 in them. But I look at overall from my very first sale I have a record of what I’ve bought and what I’ve sold. I just look at that as the cost of doing business so I’ve sent those losses and you are going to have some. If you keep names you are pretty sure aren’t going to go anywhere or do anything, they just become a liability, so you might as well just take the hit on those if you are sure “I went down that road and that is not working” best I think to just cut bait on those and then continue on with what you feel is going to work out better. Michael: When you first started domain naming as an investment, I read that you bought a bunch of junk but you learned from your mistakes. What kind of domain name junk did you buy? And what did you learn? Ron: You know I don’t even remember the specific names. Probably because this is the kind of stuff you want to put out of your mind as quickly as you can. But the way that worked was when I came in, in the spring of 2002 I didn’t know what made a good domain name at all. I had just found this forum. I mean I was the rawest of newcomers. So I had in my mind what would make a good domain name would be some fancy name. What people might be called brandables but they were really crummy brandables because I initially focused on…I would try to get some in .com and there are so many people mining that space so anything that made sense they pretty much had taken. So I still tried to do some and we were like six months into it and I had zero sales and Diana was getting really annoyed, because why are you wasting your time, you don’t know anything about this business, and you are running up credit cards and all this crazy stuff. But about six months in it dawned on me that things that I thought (and I saw people registering) like things that defined a product or a service (like swimmingpools.us). Who wants to sit there all day and write about swimming pools or a generic anything? It just sounded boring. I wanted an exciting brandable name and you are going to build something around it, but domaining is not about that. That is developing. I didn’t even in my mind then how the two sorted out. What was what? So when I started buying generic domain names which search of course takes time and also three letter acronyms which was always a big demand for, all of the sudden I started making sales. And I started out, as a lot of people did, by flipping domains in the domain forums. I would do a lot of research and maybe get one for a registration fee. And then you would put a list in the forum…You might put twenty to fifty domains in there and they may be priced from $50.00 and on the high end $99.00. I might be buying them for $8.00 and selling them for $50.00 but I would build a little capital and I would just kind of rinse and repeat. There are a lot of guys who started out that way back then. And I got better as I went along and in the course of probably the next three or four years after selling them I probably had sold maybe a thousand domains I would say. And these are wholesale prices, which I stopped doing entirely by ‘06. But once I got things started then I got to a point where I had selected good enough domains that I was getting inquiries and sales being made through small business people. And those are dramatically better of course. So I stopped I think at least late ‘05 by early ‘06 I was doing nothing more in wholesale or in the forums at all and selling strictly to small business end users. And that took you to another place on the ladder. So it is a step by step process. And what I’ve always preached to newcomers of the business is there is such a low barrier to entry that it doesn’t take a lot of capital to get started. And a lot of times people hold me out as an expert in the domain portfolio business, which I’m really not. There are guys who came when I did that are far surpass me. I’m way down the list as far as success with domains. I know some kids, and I call them kids because they were maybe in their late teens, early twenty’s, like Merlin Kauffman who has done phenomenally well, who started out as a flipper on the forums and now this guy is involved in six figure transactions. But you can do that. You can come in and you can find a niche or an opportunity and you just learn the business, learn what makes a domain valuable and work your way up the ladder. It is really a very unique business and there are a lot of things that I think you can do that in. Michael: So what you learned by buying those junky domain names was that you wanted one or two word, generic keywords and you also wanted three letter domain names. Ron: Right and my thing about the three letter domains was that those always have a big market particularly if the letters are good. If you put any three letter acronym in Google you will see dozens or maybe hundreds of companies who have a long three word name (like international business machines of course is IBM). It only makes sense if you have three long words you want the acronym. And by the same token those were because of that some of the first .coms that were taken and those domains I’ve seen go as high as 150 thousand dollars for three letter .coms. I remember Sunny with Silver State Mining get that on one chart. Even on the poorest of .com combinations can be 4 or 5 thousand dollars today. So I was looking at obliviously there are going to be Mom and Pops that are not going to get that acronym. So I looked at the alternative extension and started accumulating a lot of those and years ago every conceivable combination in the alternate extensions were taken as well. And those things have really been my bread and butter in recent years. I hold for example just in .us I have 800 three letter .us and almost all good three letter combinations without junky letters. And most of those I got for registration fees back in ‘03 or ‘04, the ones I haven’t sold now might cost $50 to $60.00. But I rarely sell those for under 1 thousand and sometimes as high as 2 thousand, 25 hundred. And I do sell some of those every single month. So now it is a nice revenue stream that has paid off after building and waiting a number of years for that particular ship to come in. Michael: Let’s dig into .us because you have talked about that of your five thousand domains that you currently have. Eight hundred of them are .us. You have bought a lot of them and you have had to sort of hold on to them for your ship to come in so you say. How did you first acquire so many .us domain names and especially the three letter domain names? Ron: Well I had eight hundred three letter – I actually have more than a couple of thousand when you add the keywords in too, like certain keywords. The way that started is very interesting. And what peaked my interest in those initially is the actual reason that I stumbled into the business to begin with. You had mentioned earlier that I was in the music business and the Internet had come along and basically wiped out retail music stores all over the country including ours. CD burning as well was another double whammy we got hit with. So I had to do something new and the one thing that I remembered from the retail business was that our website had performed so well. The internet had killed me in that business so I said whatever I do next would be involved in the internet. So one day I was reading PC World Magazine and News Star the .us registry had a full page ad in PC World that spring of ‘02. And they were talking about it had just opened up to all American citizens. Previously it had been limited to US government entities only. So I thought that’s a real opportunity. I remember how hard it was in 1997 for me to get a .com domain for our website, which was the only one that I had. So I thought this could open up a lot of opportunity. So I started researching on the web. That is how I stumbled on the forum and found out that there was this whole business that existed buying and selling domains. And I thought you can own a word, the rights to a word, and I thought this is like the most incredible business there is. So .us is what kind of peaked our interest. So naturally I have an interest in registering the .us domains as well as some of the others that I learned about. What was unique about .us as opposed to all of the other extensions is that the others would all publish public lists of what was going to drop, what would drop on a given day. More importantly with the others you knew the exact timeframe. For example, I don’t know if it was 2 pm or 1 pm whatever it was, let’s say .coms would drop at that every day, .orgs would drop at a certain time every day. But what the .us registry did was they would drop them at random times. You had no idea when they were going to drop during the day. Only that these names were going to drop at some point in time. There was some enterprising young guy on DNForum who came up with a desktop script that he sold to the other guys on the forum for like $39.00 each as I recall. You could buy this script and you could run it around the clock on your desktop and you could just feed into the script all the keywords and the TLDs that you wanted to chase. In my case I wanted .us but I didn’t know what time of day, so I’d just feed them in. You could leave the room. Go about your business and you could just come in every half hour and some of those things from your list will have popped in to the right side of the screen that had been registered for you. It worked with your registrar to automatically do the registration. So your hands were off. I remember walking into the room and getting some really cool, generic and some valuable .us geos like a Reno.us, which is a great site Greenbay.us, Galviston.us, all these midlevel city domain names for $7.00. The big cities the people weren’t dropping but you could get things like that. And three letter domains – every day you get twenty or thirty more high quality combinations. And the reason that that happened and why those domains were available was that the summarize period for .us, when it became open to the public was in the spring of 2002. So a lot of guys went in there and were hoping this was going to be the second coming of .com which is the case with every new extension. It turned out I think we all probably know now that is not going to happen with any extension, but they have that hope. And a lot of them bought all these domains up in the land rush. With .us initially you had to take two years, not one. So in 2004 now you are coming up for renewal. All these people who had paid the Sunrise fee plus a two year registration and they said, “Wow nobody wants these. I’m not selling them”. So they just threw in the towel and dumped tons of great domains. We call up the guys who were chasing us, called them the anniversary drops and every year there would be more that affect has kind of faded now in recent years. But that was an opportunity, if you believed in the Internet and that growth was going to carry over to some of these other extensions it was an opportunity to pick up all those things at registration fee. I did it with the script-in one point in time opportunity, which has now pretty much gone away. Michael: I want to come back and ask you more .us questions but you are saying you acquired most of your say three letter .us domain names in the 2004 time period (maybe even 2005) as some of the drops were happening. How long did you have to hold them to be able to monetize them as you are today for a couple thousand dollars a piece with no sales in-between? Ron: I always have sales from the beginning. By that point in time but what I was going then was again I was catching these for registration fees. So some of them that I thought weren’t the greatest combination I would just flip them. I just got through paying $8 today and there are guys on the forum today still doing that. Michael: So you would flip them at wholesale on the forum, for $50 – $100. Ron: That money is paying my carrying cost right off the bat. And then as time went on and the general economic world changed, where more businesses were coming online and needing names then I started seeing inquiries coming in from outside where I didn’t have to wholesale anymore. So I always held them. I never dropped three letter domains, ever. I’ve sold some cheaper back them which I don’t do anymore either. I almost never write about .us on DNJournal.com because I don’t want people to think that I’m publishing something because I have an interest in it. I’ve had people say that if I write one time about it – oh you are pushing…But that is really silly because I don’t sell to you. To the domainers who say that I don’t sell to and end users are not reading the end journal. It is an industry publication. So if I did write about it, it is not that I would be touting anything as I’m not selling into my readers anyhow but to be on the safe side I just pretty much stay away from it. Which in a way is unfair to the extension, because I believe in it, but nonetheless you don’t want that appearance out there either. Michael: Yes, definitely. So you own a big cache of three letter domain names. Do you have any two letters, four letter or are you pretty much solely three letter? Ron:	I have some two and of course .us doesn’t have two letters. They are talking about releasing them as they did for .biz, even did the one letters that came out. We will probably eventually see those but those are going to go for much higher prices. The economics are so different now than when I came in. Again it was a thing that required very little capital. Today the way everything is introduced is a totally different. Even when they bring out new GTLDs they are going to auction off those kinds of names that we used to get for $7, and you have to bid against others and it could be hundreds of thousands of dollars. Michael: You mentioned earlier you avoided some of the letters that were terrible letters. What are the letters of the three letter domains that you don’t own? Ron: Very few that would have a q, x, y, or z in it. And the reason for that is that if you look in the dictionary there are very few words that use any of those. So the odds of so many words starting with those four letters being in a three letter acronym used by a business are pretty slender. I might have one in it. Sometimes you might see one like EQI or something like that but I probably don’t have more than a handful. Everything else are the very popular letters like a, c, i, s. Those because a lot of things in them, Inc for i, c for company, or s for systems or services, that sort of thing. Those are always in demand and we will sell for more money because there are more suitors for those domain names. Michael: So you have got three letter domain names. Do you buy any three number domain names? Ron: I do have some of those. Oddly I haven’t done as well with them. I have never been a huge fan of numerical domains but I know some guys do really well with them, but it seems to be mostly in the .com space. I do have some four number .com domains and I do get a lot of inquiries on those. Not a lot of them though. Even though the three number domains are rare there are fewer combinations than there are (considerably fewer) than there are just not used in business as much. I’m trying to think back if I even ever sold one. I have some nice ones like 711.us which is not the trademark it is also a gaming term and it’s not even 711 is how the convenient store even spells their name. I’ve just haven’t had a lot of luck in that area. I might have fifty of those or something like that. Michael: You have 800 .us domain names that are three letters and clearly you need to start selling them. How do you personally go about selling the domain name? Let’s start there how do you start selling them? Ron: The vast majority of my sales over all of the years particularly after I got out of the forums and end users, Sedo sells a lot of domains for me, a lot of the .us domains. The country codes are an area where they just totally dominate so it is a really good venue for that. So I would say half of my sales Sedo does and the other half are direct inquiries and I think that is how a lot of sales take place. As a business is starting up they have in mind the domain that they want to use. They have already picked the name for their business. So then they go out online and find out what’s on that domain name. Is it available? It is taken? And naturally they are going to look at the .coms first and if it is taken by a big business or they make an inquiry and if it is not available they will start looking…because they will go to a registrar and see all the options listed now. Every registrar will show you .net, they will show you there is an .org or a .biz or .us which is helping recognition. So they will type in each of those so it is very important if you are trying to sell a domain and you have it parked to make sure you use the option that your parking company has that this domain may be for sale and will they have a link that will click and send an email to you. Michael: Ron we just lost sound. I can’t hear you at all. Ron: I haven’t touched a thing. Michael: There we go. You are back on. I’m sorry about that. Ron:	Now I’ve lost my train of thought there. Ron: What I did was I wanted to emphasize and therefore say it all. In a parking page you can put that one link but they could easily overlook that because it is just a sentence with a link. So when I decide I want to put a heavy emphasis on these domain names being for sale and also move them to a set price (which all the market venues are saying could allow you to sell two or three times the number of domains that you currently do). So I just started doing that a few months ago. I set up a tailored landing for three letter .us domains and it allowed me to do several things. One: Make a case for why a business would be interested in using .us and a little bit about country codes and what .us is. Also make a case for three letter domains themselves or the value of those. And then some other points about they may not be able to get familiar with because people in mainstream business have no idea about domain names, the processes of moving them around and that sort of thing. To tell them how easy it is today to move a domain from one place to another. It is as simple as an instant push. How easy the payment processes are (we even offer a payment plan on those now which I really hadn’t done before) a twelve month period. And I think I have about 250 of those moved over. So I have just started the process. But I have already had sales off of those pages, off a set price in a higher velocity than I was getting through the other process of relying on the parked page or Sedo to send them through. So I am in the process of moving all – I’ll move all five thousand domains that are not producing significant revenues to traffic onto my own landers. But now I feel, as well as PPC revenues are, I will get better value using that traffic for my own sales platform than taking the few pennies you get from them parked. Michael: Great example. So you are not making any money on parking so why not move them to your own platform where you can educate people coming to the site about why .us, how a three letter domain name can help them, how easy it is to push it. So I have gone to one of your domain names. We talked about this a little bit yesterday. One of your domain names that you have available for sale through your own system is AFI.us. Albert-Frank-Incorporated.us. And it says, “Welcome to AFI.US. Make this premium domain your new address on the net. You can buy now for $2777or lease to own – 12 months payments of just $266 a month”. That does make it much more palatable to a business who wants to own it. Ron:	I came out of a small business environment. I think that was always an advantage to me in dealing with small businesses which is again why I targeted that segment of the market. For one thing there was no point in me going after incorporations because most of the good names I have are not .coms. Corporations have the money to own those or buy them. So to me the huge untapped market was small to medium size businesses, which makes up to 70% of the American economy. So I target those people and having operated my own businesses I knew about what the budgets were and I knew that it can be important to be able to pay over the course of twelve months because maybe I don’t have two thousand up front to pay for a domain name but it makes me possible for me a name that I want. And I have done a number of deals on those that way. And it creates a revenue stream for you. What I also do to make it worth caring is I will add, whatever the purchase price is, I’ll add 15% to that and then divide it by twelve payments. Which makes up for your time in having to track those, collect the payments and so on. It is worth your while to do it that way as well so it is a kind of win/win for you and the small business. Michael: So you are financing the purchase, you mark it up by 15%, you get the payments in on a monthly basis and then when the payments are complete and it satisfies the purchase amount plus the interest, you then push the domain to the new owner. Ron: Right and if in any point of that process I did write up a small, one page, very informal contract that spell out the terms. If at any time their site is not working for them and they want to up and pull the plug. They can just stop making payments and anything they will have paid will just be considered rent at that stage. And they just walk away with no obligation to make the rest of the payments. But you have retained ownership throughout that. So you don’t lose control of the domain until it has been fully paid for. Michael: Well, we just saw Diana walking by so we did get her on camera. Ron:	She’s on whether she wanted to or not. People will be rewinding the recording to try to catch her on. Michael: Exactly. Alright Ron just before that you were talking and said that you read online that selling the domain…that putting a set price on the domain, so you are specifying a set price on the domain rather than make an offer increased your sales volume by two to three times. Have you seen that that is the case when you moved off Sedo make an offer to your own platform that specifies $2,700 per domain? Ron: I’m really into – and that $2777 is just for that one and that is a little on the high side because that is a domain that I really don’t want to sell, that I have some ideas for it. So the vast majority of mine you would see the average price is like $1177. I sell a lot of domains just over $1000. It is very early in the process, I’ve only started moving to those landers. Like I said I’ve got less than 5% of my portfolio moved. It is time consuming even though it is only a template and all I have to do is change the name at the top and the price for that domain. Then you still have to go over to your registrar and change the forwarding. I set them all up on InternetEdger.us and post all of the pages there. And now I have to go to my registrar and change the forwarding so when they type in AFI.us they land on that page at the registrar. It takes about five minutes for each one. You have to spend an hour or two each day to say move 20 or 25 over a day. So it could take me a better part of a year to get them over. But every single major after market venue is now really pushing fixed pricing. Sedo is (Inaudible 41:00) and all the others who have had a good deal of experience with it and they are the ones who are putting out these stats that are saying that they are seeing at two and a half to three times more sales on priced portfolios. And having been a small business person that does really make sense. I don’t want to go in to buy a domain– tell me what the main price is. I don’t want to get into a cat and mouse and then they feel like they are being hoodwinked. Just tell me if it is in my budget and if I like it I’ll do it. So it is only common sense. So that is something that I finally decided to write about that. And it is kind of a hassle for me too as a seller to go back and forth with people. I’m not like that with any kind of product – the whole haggling thing. I’d rather just – tell me the price and let’s go from there. Michael: Do you ever get offers for a domain like AFI.us where somebody might write in and say love the domain I’ll offer you $1200 for it? Ron: Oh yes, I get lots of those. I usually blow them off. I had one for MTG.us (miles per gallon). It was not that bad an offer but it was in that range but I had no intention of selling that because I think it has a lot more potential for a domain name. So I turn down a lot of – for the particulars I moved to the fixed price model now I really try to price those – I consider each name and say what is it worth to me, what would be the least that I really want to sell it for. And even if the price in some people’s minds is too high to me it is worth more than that. I don’t care if I sell that name or not. Otherwise I may go as low as say under $500 a handful I just really don’t have much use for them. I’d just as soon see them go. Michael: So how do you set the price? How do you know if an AFI.us is worth 3 thousand or 1 thousand? What sets that firm price? Ron: It depends on the letters and again this is just from experience but the high quality letters there are in the name that are more commonly used. You can do a really quick check on that by just going to Google and throw that three letter acronym in there. There are thirty million results for those three letters then it’s being referred to or used by a lot of people. If you throw it in there as 1 million results then there aren’t that many existing businesses that use that and it is not as popular an acronym. So I take that into account. I have about seven or eight different price levels. They’ll start at about $477 and run all the way out to (something is really killer I think I have HGH.us, human growth hormone, which gets huge traffic) to me that domain has a lot of potential so that is in the high – still under five thousand dollars, because again that is a sweet spot in the market. And not just for small or medium size businesses but really most businesses at one thousand to five thousand is where the vast majority of transactions take place. Even though people will see the charts and the top twenty is going to be five figures and six figures that is the crème de la crème of the domain market. Your everyday sales are more in that low four figure level. Michael: So when you say a domain like HGH.us is getting huge traffic clearly they are not searching for it because it’s been parked, it’s not ranked well within Google. They are typing it in. They are typing in HGH.us into their browser. Ron: I don’t think a term like that is such a big term. People do Google. And then you also have to take into account global traffic as well. You have searchers outside the U.S. who think in country code terms. So if they are looking for a supplier or something in the U.S. and they are in Germany they may type in the keyword and put .us. Interestingly a lot of my buyers for .us domains and other people who sell .us will tell you a lot of the buyers are from outside the US because again they think in country code terms. Maybe they are going to open up a business and start servicing the U.S. so they think of that in that term. So they account for a lot of business in that extension. And that is perfectly in accordance with the NEXUS requirements of .us. You can be an American citizen or you need to have a business interest or presence in the U.S.
Michael: So a lot of people within the U.S. may not think about the .us extension but outside the U.S. they are thinking in those terms because they own .co, .uk or .jp for Japan or what have you. So they are thinking already .us. Ron: That is right. The extension still has unfortunately very low recognition and rate among the American citizens. We are now nine years out that is has been available. So it has grown each year but it is still infinitesimal to like .com’s recognition. That is one reason why you mentioned earlier about the educational aspect of those landers. If I’m not selling that domain everyone who comes there gets a two paragraph education on what .us is. And why three letter acronyms are popular and hold value and that sort of thing. That unfortunately has been a bugaboo for all the industries that .com didn’t have to deal with so much because it was the first big commercial extension so the companies themselves through their advertising made .com a household word that is synonymous with the internet. Where the other extensions you can’t duplicate that money that was spent on .com. News Star takes a lot of grief from people who say why don’t you spend more, and I would like to see them spend more money don’t get me wrong, but it is almost an impossible task. They could spend ten million and how much of a dent in the market is that going to make. But it would help. So hopefully we will see more promotion. .Co is a great example of what millions of dollars of promotion can do for you. So it can be done. Michael: And when you say that HGH is getting huge traffic, huge type in traffic what might your traffic look like? Is that a hundred people per day or ten thousand people per day? Ron: I’d have to go back and look but it would be thousands of visitors a year for a .us type in for a .com it wouldn’t be. For .us it would be unusual to see a hundred visitors a day and that is three thousand a month we would rarely ever see that. And that domain probably closer it might have five or six hundred visitors a month instead of fifty or something like that. Again .us in any ultimate extension is not going to be a good traffic play because people are again going to .com to whatever keyword search term is. So again it is a niche. And I think that is always a good way to play particularly for newcomers to come in. Where you have got all these really smart guys, they know this business inside out, no keywords and it is tough to go head to head with those guys. I kind of at least was smart enough to know that I was outmatched by those guys who really knew what they were going. So I was looking for things that they were not paying a lot of attention to. And it was something that I could create a revenue stream from. It wasn’t necessarily the best move like I said. I saw guys back then who flipped .coms and started very small and have done incredibly well. So if I had it to do all over I probably would put more resources there but I still would have done what I’ve done here as well. It was kind of a situation with the growth of the internet where it was hard to go wrong. If you picked good keywords and good acronyms the rising tide was lifting all boats. So, you know I have no complaints at all. It is a nice steady comfortable revenue stream there. Michael: Do you ever take a proactive stance? Do you ever reach out to domain name owners of the .com or other extensions and offer your .us domains for sale? For example American Film Institute owns AFI.com. Would you ever contact them and say are you interested in buying AFI.us? Or you call a flag manufacturer and say would you like to own American Flag Incorporated .us? You can have the three letter domain name in the US? Ron: No I have never done that. Again it comes down to time. What is the best use of the time that I have? In the little bit…I might have done it two or three times back in say ‘03/‘04. But the extension wouldn’t have meant much to then at that time or even today probably not a lot. But I think your return, your success rate on contacting people cold calling them with a domain name which they don’t understand anyhow, getting to the right person there is so much work and labor done in that with a maybe 1% success rate. I’ve found that most businesses particularly, again in my category the small business people, they have already got the name in mind. And most of them are a new business or a business with an unwieldy name that is not working. There is mistyping all over the place and maybe they want something shorter. So I never have been involved in direct marketing at all. Some people do it but I just think for most people it is probably not a productive use of time. I would probably advise someone rather to do that to pick something that you really love and invest that time in developing at least one domain. Because in my case and I have got thousands of domain names but one successful developed site, like DNJournal.com, creates much larger revenue stream than all the five thousand other domains do combined. So that is what one hit, one developed hit can do for you, as opposed to passive revenue of either parking or even selling. Another key statistic that a lot of people have heard but some people watching may not have, because they think you are selling domains left and right every day, is that regardless of how good your portfolio is the statistics show that of an average portfolio only one to two percent of those domains are going to sell in any given year. 98% of your domains are not going to sell. So it is good to diversify those dreams. You know parking as much as it is down it is just nice to have a little stream there to cover renewals. Sales are great and increased in importance now that parking is down they have had to compensate by selling more domains. And then develop something, like I said do something that you love because development is very hard work and you are going to get bored with it and you are going to leave it unless you are sitting there every day writing about something you really care about and it is a community that you can relate to and strike up relationships and people are going to start linking to you, but if you do that and come up with something that takes off now you have a really nice diversified revenue stream and if something (like parking fell apart) it’s okay because these other things picked it all up. Michael: So am I understanding you correctly that you make more revenue from DNJournal.com advertising than you do with your domain name portfolio? Michael: Alright, a lesson learned for all the domain flippers that are buying and flipping and aren’t really spending any time thinking about development. They should spend a little time thinking about it. Ron: I think everyone should pick at least one project, because even if it doesn’t hit and that can be a long shot too. You have got aside from the work you do learn so much in doing that also. That helps you in your domaining thing. How certain keywords are working and how hard it is for people to find. It is just a great experience to do that. But your chances of success in development are so dramatically higher if you do something that you really care about too. It’s kind of can be your hobby. It doesn’t feel like work when you pour yourself into a project like that. And a lot of people recommend that and I think it is very sound advice. Michael: It is true. I can speak for that as well. My last business was a hobby that I started in my off hours in corporate America and it grew into a very large business that I was luckily able to sell. It can turn into a nice revenue stream and go from there. So I looked at AFI.us and went to your company InternetEdge.us, I couldn’t find the Ron Jackson portfolio so I can look through every single .us name that you own. Where can people go to see your portfolio? Ron: Well I used to do that and I actually discontinued to doing that about a year ago. I had separate sales sites. The thing that was kind of in vogue when I came into the business was for everyone to have their own sales sites. A lot of the veterans had them. Like Greg Ricks who owned the beinformed.com. I can’t remember now because he took his site down a number of years ago but he had all those domains on there. And a lot of guys still do it today. So I set up two. I set up one for the traditional extension which was I think domains.com which was the common orgs. And I did another one at newnames.us, newnames.biz and newnames.info and I put all the alt extensions on those. And I ran that for several years but what I found over the years was very little sales activity went through there because you don’t have the critical mass. If you are just one guy and you are not spending a lot of money marketing it no one is going to know those sites exist. So you are better off going to a co or an active dls that has a critical mass and name in critical markets. That was one thing that I found just wasn’t worth updating that every week as new names came in and others went out. The other thing that you would start seeing a few years ago, a new DRP proceeding, I have never been in one myself, but I would see case where guys who had those sorts of sites the person filing a UDRP against them would try to use that against them. See they have no legitimate interest in the domain and just bought it to sell it. Now it seems to be a lot of decisions to being recognized as a legitimate business in its own right. But a lot of cases it wasn’t. So you might be endangering yourself to do that too. I think about less than a year ago I took off the new names site where those portfolios were listed and also the other site and just market them individually now. Again I think that other than add a seed where there is millions of options, even if you just have a few thousand options, I still find in my buyers at least that they had the name in mind already. They are not going to come and look through a small list of three thousand names and say I’m going to settle on this one or that one. They can always go to Sedo and see a thousand times more options. So I don’t think for the most part it’s a great use of your time and for me it wasn’t productive. Michael: So where a domainer may or may not want to look through your entire portfolio and take a look at it they are going to make a wholesale offer, you are not looking at that. You are looking at end users so you can make retail and they are going to have something in mind and they are going to come to the website to look for it. Ron: Right and that is a good point because there are guys who still the domainers are their market and in that case it makes a ton of sense to do it that way because with the domainers it is great to show them your list. But it just hasn’t been my market for years. Michael: I have read online in some of the forums that is you call up a registrar and you say I’ve got these domain names coming out and I am thinking about moving them to another registrar because they can save me two, three, four dollars a year they will actually grant you a discounted price. Have you seen that with your domain name portfolio because you have such a large portfolio? Ron: Well I had actually never been offered that even though I have thousands of domains. That is a good illustration of there is a lot of things I don’t know even though I have been in the business eight years. I just thought when they raised the prices every year that is what you pay and that is it. And I was at, just in the past year, at a conference and I believe it was Don Lyons that I bumped into who is my account rep at Moniker and I had mentioned…He had asked me where my domains were and most of my names are at ENOM another registrar which has been very popular with domain investors for years. And he said well if you move those over we could give you a really good price. And I just kind of filed that away and then another big price increase came in last summer like they do every year. So I called Don and said this is just really pushing my cost way up. And he said how many domains have you got and I will send you back an offer of what we can do for you. So he sent an offer back with considerable lower prices and ENOM now has to match that. So now they are both bidding because you know five thousand domains at the average of $7 that is $40 thousand dollars of income for a registrar. So it was worth their while. And then I found that they all do this with the bigger portfolios holders. So if you hold several thousand domains you can negotiate between registrars. Go to one registrar and just say give me your best price and go over to Moniker and get your best price there and I ended up last summer after those increases paying less than I had the year before rather than more. Which most people did when they were stuck with the increases. So both ENOM and Moniker were very fair to me on the pricing and I am very happy with both of them. I have domains between them both. Michael: And if you move them do you receive like two thousand emails saying we are confirming this and you have to click a link to confirm? Ron: It can be a hassle. I think that is one thing that the registrars have always counted on. It is such a hassle they are probably not going to move. I had actually started moving some over to Moniker when Don gave me their price list and that is what I think alerted ENOM. They said hmm he is seriously going to move some. And my accountant rep from ENOM gave me a better price there. They always say everything is negotiable in business. I unfortunately am not a great business person. I am more of a journalist and a verbal kind of guy and not a numbers guy. So if you are a good business person you can definitely negotiate things. To me I just didn’t give it a thought to but I should have. Michael: That is a great tip. I’ve been getting some very nice emails from the DomainSherpa audience. One person wrote in and said that every successful domainer should be able to answer two questions. What is a good domain name and how do I find it? How would you answer those two questions? Ron: What is a good domain name was a lesson I had to learn too. And it is a difficult one for a newcomer to get a grasp on. But I think what makes one a good one is something that defines a commercial product or service, because that is what people are going to either search for that online and you are going to rank high. With a .us you are going to do pretty well on the rankings if you have a good site and not just parked there. It will give you a big leg up. Not only in search but then if you also have a category defining term and a trust built into that too where a customer says wow that guy he isn’t the name of the whole product or the whole category. So that makes a domain valuable. And also the three letter acronym because there is a big market for those. So how large the market is for something is part of it. Being short is helpful because of the issue with typos. Being memorable is definitely key. If you tell someone your domain name, forget two minutes later it is hard to remember. That is way some of these names even like Google are made up names are pretty easy to remember. So, some of those things can have value too. That I think is the answer to the first part. Where you find them is you, like I said very early on in the interview is all the registrars or registries publish a list of everything that is going to drop every day. So your best bet as to what is going to come on the market is what’s being dropped. You can also go in, and of course put in ideas that you have and all the registrars again will show you all the extensions and you will see the .com in almost everything that you can think of gone but they will show you what’s available in all the other extensions. So you might consider some of the stronger alternate extensions because in there if it is available for the registration fee risk you only seven or eight bucks. So that is how I would do…You could also contact the people who own the domain now and again you are getting into this direct contact thing like you were talking about do you market domains. I have never been very fruitful is to contact people about buying names from them but on the other hand guys who work that, I don’t have the time for that, but guys who work that come up with some really major scores doing that. So it all depends on what your time allows you to do. Michael: And what you are comfortable doing. Michael: One last question, Ron. You have been through a lot in your domaining career; you have provided a ton of great advice over the past hour. If someone is brand new and they want to get into domain name investing today and they had say five thousand dollars to invest, besides go read the forum, read DNJournal.com, read the sales charts to find out what is selling, they have listened to your advice, they have heard what is a good domain name and how to go find it. What would you recommend that they place their five thousand dollars in? New TLDs coming out, old TLDs that are undervalued, niches, up and coming trends, what would you recommend? Ron: I think I would probably divide it up. Try to get some .coms in one area that makes some sense. Again that is getting very hard to do with tens of millions of them registered. But I mean today people are telling, again I’m not searching drops anymore, but there are some pretty good values at five hundred dollars or a thousand dollars and meaningful .coms. Five thousand won’t take you very far doing that and then you have a lot of eggs in that basket of two or three and at one or two percent sale that could be a really good sale in a year. That is tough to sell. And I started out with a small amount of capital too because I was just coming out of a music business that had gone under. So I had to be careful how I spent money. That allowed me to put a lot of eggs in a basket buying some of the newer things. What we used to call new TLDs and are now a decade old, the .info’s, .biz’s and .us’s (I again prefer the .us’s because the country codes are very strong). I did better off with .biz than I thought I would because it was an extension I didn’t like and most people didn’t, thought it sounded cheesy. But Mom and Pop businesses are buying those and I sell a bigger number. As far as new TLDs which aren’t here yet, they are coming but I am going to be very leery as a newcomer putting money in because it takes so long to gain recognition. So you have already looked at something like a .us and that is not very meaningful but we are nine years in. And it is still hardly on the radar. So now you have got something that has just been introduced and you are looking at a decade before anyone knows it is there. So the number one thing, and you touched on it at the very beginning, before you spend the first dollar do a lot of research on all the sites. It was a mistake I made. I jumped in and there are so many more resources today than when I started. So there weren’t a lot of resources and I just kind of jumped in and tried to wing it which doesn’t really work. Now there is all the information is out there. So educate. The opportunities are always going to be there. Deal with what you are comfortable with and just kind of try a few different things. Michael: Ron, it is my job to conduct interviews that provide concrete actionable advice from successful domain name investors like yourself so that the audience can write them down and take their notes and immediately go take action after the show. I think you just helped them accomplish that. How can the audience contact you to say thank you for the valuable time and the advice that you just provided? Ron: Our email is editor@dnjournal.com. That is probably the easiest way to reach me. Michael: Are you on Twitter and Facebook also? Ron: I’m DNJournal on Twitter. So you can follow us there and every time we have a new story out I will, of course, post it there. Both Facebook and Twitter you can send messages through. And on Facebook I’m Ron Jackson. There are a lot of Ron Jacksons as it is a common name but I did get Ron Jackson because I think of naming so when that came out I jumped on that. Michael: That’s valuable. Ron, thank you so much for doing the interview. Thank you more than that about the part people didn’t see. You spent thirty minutes with me yesterday doing a pre-interview that really helped. So thanks for all the time that you have spent. Ron:	Thank you, Michael. It’s been really a pleasure. It’s been a great pleasure and I really enjoyed it. Michael: Thank you. Thank you all for watching. Bye. Excellent video. I appreciate the tips and insights that were provided here. Props to both Mr. Jackson and Mr. Cyger for facilitating such good content/interview. Ron is absolutely right, 100%… You are much better off trying to make one winner than juggle bazillions of domains. 1 winner can make all the difference. Thanks Michael, and thanks Ron. Inspiring stuff. Hey Michael, any way to amp up that videoplayer of yours? I accidentally clicked the back button like 40 minutes in and now I can´t fastforward. Also: an idea regarding wording from a fellow journalist. MAYBE a change from “The domain name authority” to like “Domain name authorities” could be productive, because I believe that is what your after. And doing great at it I must say. Just a small shift from what is perceived as promoting yourself as an authority to promoting your “sherpas” and your interviews. Thanks, Anders. I’m glad you liked the show. The video player allows you to click anywhere you like around the video. It then buffers and plays from that point. So, let’s say, you accidentally refresh the page half-way through watching the video, you can simply press play, then mouse-over the video to see the timeline displayed at the bottom. Then move your mouse to the area you want and you should see the cursor change from the typical arrow to a hand with finger pointed. Then click, and it will advance you to that point in the show. Let me know if that works for you. I appreciate your comment about the tagline of DomainSherpa. At both the “about me” page (https://www.domainsherpa.com/about-michael-cyger/) and the “about DomainSherpa” page (https://www.domainsherpa.com/about/), I try to make it very clear that I’m not the sherpa and that I find the people who are. I think the current tagline is cleaner and easier for regular people who don’t have much knowledge of the domain name industry to understand, which is the target audience of DomainSherpa. I appreciate hearing your thoughts. What a great interview. Really enjoyed Ron’s comments. I knew he liked alt extensions, but didn’t realize he had so many .us domains. The AFI.US lander is very nice and offers just the right amount of information. Thanks for this interview. Informative, entertaining, very well done. Thanks, Max. I appreciate your comments and support. I, too, really like the way Ron has built the landing page for afi.us. I think there’s something that we can all take away from his process and design. Another tremendous interview with one ‘in the know’. Thanks Mike and Ron. Your insights and efforts very much appreciated. Thanks, Tom, for your comment. Thanks, GDM. I’m glad you liked it. The 1%-2% sales mention and cold calls are spot on. I argued that point against another, They objected to me challenging cold calls. I have cold called hundreds of end-users, even with domains owned by another. It is not worth the time. When Ron mentioned Sedo selling many good domains at Sedo, is Sedo marketing these or looking for a buyer? I have some good .us there. I managed to push one job one there. .us job domains are good sellers. I was wondering whether the .us are moving with a fixed price, or if Sedo is helping to broker the domains? Ron is right about picking certain niche to develop. I recently started a movie site. It doesn’t feel like work writing reviews. I don’t mind watching a movie, and then preparing a review. The website also has a custom logo as well. I know a lot about education. Ron’s interview and the once last week work together. Directories are the way to go, especially in the service domains. I have no interest starting a resume or cover letter business, but I don’t mind pushing traffic to a company with a directory and an affiliate program. I still yet to close an affiliate lead into a sale. Even with people clicking, they don’t buy an item.Affiliate programs are a challenge. DNJournal has helped to determine which is popular. Auctions are good to watch to see what is selling. You can find some good domains available for the cost of registration and in small auctions. In bigger auctions, you will have to compete against several people. The price will soar out of control. I won all three domains I bid on over the past year. I always wait until the end to get a piece of the action. I read the interview transcript more in detail. There are many points touched upon that I have experienced myself. You gain experience to improve. This year, I’m rarely purchasing any domains. I let many drop. I’m investing more time into building the sites instead of proactively contacting buyers. Thanks again Ron and Mike. I didn’t watch the video feed. I decided it’s better to read the transcript. Great comments. Thanks for sharing. Awesome to see an interview with Ron. I enjoy DNJournal. The domain sales report motivates me. Thanks for the mention below $5000. Great advice and tips. Thanks Ron for representing the domain industry. You continue to amaze the domain industry with scoring the best interviews. Thanks for putting in the hard work. This interview and the hour i spent watching it just exceeded the value of content value i received from the last two domain conferences i attended. Seriously useful. Thanks, Ron and Michael. Thanks, Paul. That’s a very nice comment. And motivational for me to continue interviewing. Nice interview great tips about developing one site about something you love and have passion for and it going big! Ron is and always has been the class of this industry. Real fun and informative interview, thankyou Michael. We all know what a class act Ron is, but was great to see a long interview with him. Big thumbs up for Domain Sherpa! Thanks, Ron. You’re a great role model in the domaining industry. I appreciate you opening up in this interview. Thanks, Michael for another great interview. Every Tuesday night I check your site over and over again to see when you’re going to release the latest interview. ha! Love it! Thanks, Terry. Ron is a true role model in the industry.